In the relatively small area of Montenergo, nature has produced unique contrasts; the quality and diversity of its natural and anthropological values, makes Montenegro one of the most attractive regions in the Mediterranean. Over a span of only 100 km in a straight line, three natural environments are distinguishible: the seaside, the karst field zone and the high mountain region. Thus, the tourist has the the possibility of taking a swim in the lakes or in the sea, rafting down the river and skiing on the mountain slopes - all in one day. 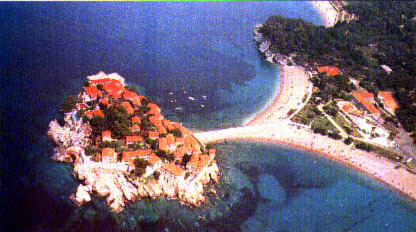 Many famous travellers, poets and painters "discovered" Montenegro and fell in love with it. Lord Byron wrote: " At the moment of the creation of our planet, the most beautiful merging of land and sea occured at the Montenegrin seaside... When the pearls of nature were sworn, an abundance of them were strewn all over this area..." From the top of Mt.Lovcen, Bernard Shaw exclaimed: "Am I in Paradise or on the Moon?!" As far as the development of tourism is concerned, the most attractive resource is the 200 km long Adriatic coastline, with a multitude of beaches and inlets. Natural beaches are over 55 km long, including more than 31 km of sand strips, some of which are kilometers long and others only a dozen meters. The beaches are of the extreme quality and many of them have been classified as extra category and among the most beautiful in the Mediterranean by WTO experts. Captain Jaques Custeau, who investigated the pollution in the Mediterranean with his scientific team, described the Adriatic as the cleanest area - particularly its southern part - the Montenegrin coast. 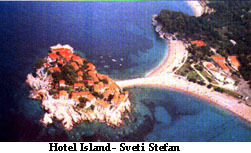 This is mainly due to the fact that there are no industrial polluters along the coast of Montenegro. Its attractivness is particularly enhanced by the mountainous hinterland - and the Bay of Kotor - the most beautiful fjord in the Mediterranean.